Previewed at: Hoyts, Entertainment Quarter, More Park, Sydney, on 23 January 2018. 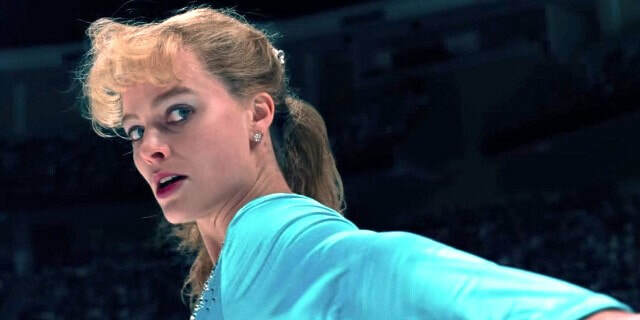 Aussie director Craig Gillespie’s I, Tonya is a bone-jarring ride on ice exposing the ‘real’ story about one of America’s fallen heroes, Tonya Harding (Margot Robbie), once an American figure-skating champion, who fell from grace over a malicious attack on her main rival, Nancy Kerrigan (Caitlin Carver). The story was a tabloid sensation in the ‘90s and Steven Roger’s inventive script endeavours to throw light on the conflicting versions that Harding, her ex-husband Jeff Gillooly (Sebastian Stan), and her estranged mother LaVona (Allison Janney) gave of the events at the time and in the years after. I, Tonya clearly shows that if you convince yourself about the ‘truth’ of something, you’ll end up believing it as, well… history, or at least your version of it. In a ripper role as the white-trash kid who grew up surrounded by violence and eventually gave back what she put up with for years, Margot Robbie absolutely nails Harding, whose rise to fame in the 1980s was followed in detail by obsessive fans. Harding grew up in a violent, single-parent household with a domineering mother who recognised that her daughter had an innate talent, ice-skating, and set out to make sure she became the best in the world. Janney also nails the chain-smoking, foul-mouthed matriarch who stepped on everyone’s toes and spent most of her life intimidating Tonya, to the point where the girl up and left with the first guy to show her any affection, a man who subsequently put her through the same violent misery. Gillooly was a weak monster, a man who used his fists to speak as he was incapable of expressing himself in a normal fashion. He hung out with an equally dismal character, his ‘bestie’ Shawn (Paul Walter Hauser), a fantasist who still lived with his mother, a deluded man-child who inhabited a world of his own creation. Together the two of them concocted a plan to remove Kerrigan from competition, thus ensuring Harding’s selection in the US Olympic ice-skating team, a plan that was as stupid as they were. The story of I, Tonya is told through a number of actual interviews with the main characters (whose words are often used verbatim) and illustrated by a series of flashbacks to back up their version of events. Nicolas Karakatsanis’s cinematography captures the ice action sequences beautifully and it is then finely edited by Tatiana S. Riegel. A stunt-double skates for Robbie and, for the most part, the combination is seamless. ‘Our’ Margot portrays Harding from her teens through to her current 40s and is simply sensational - even though the character is somewhat unlikeable - and the rest of the cast are just as good. Bobby Cannavale is also given an airing in the guise of Martin Maddox, a tabloid journo who spends most of his airtime laughing ironically at how the story unfolded. It’s a clever device and one that adds to the overall sense of chaos, as does the technique of repeatedly breaking the ‘fourth wall’ and having the characters speak direct to camera. However, it’s LaVona’s foulness that sets the tone for the film. Janney plays the mother from hell and does not let her audience forget it for a moment. At the preview screening there were audible gasps (and laughs) at some of her rhetoric and she is well in the running for Best Supporting Actress at the Oscars this year. Robbie is also a nominee for Best Actress and Riegel for Best Editing. It will be interesting to see if they manage to knock a few billboards out of the way!